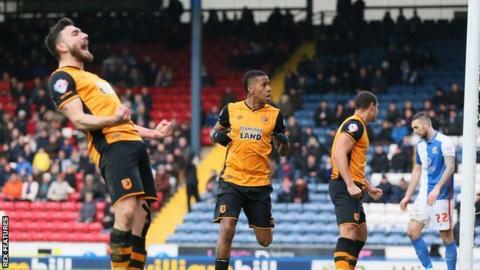 Hull City moved top of the Championship with victory at Blackburn Rovers, who are now winless in nine games. After a goalless first half, Hull's Abel Hernandez rounded Jason Steele for his 16th league goal of the season. Uruguay striker Hernandez then turned provider as he set up Mo Diame to double the advantage from close range. Blackburn's best chances saw Elliott Ward's tame effort cleared off the line by Andy Robertson and Ben Marshall's fierce shot saved by Allan McGregor. Steve Bruce's Tigers have now won five of their six league matches in 2016 and moved two points clear of Middlesbrough, who face Leeds at Elland Road on Monday. Rovers have not won in the league since a 1-0 victory against Rotherham on 11 December. Paul Lambert's men have scored just 25 goals this season, and having sold their top scorer Jordan Rhodes to Boro in the January transfer window, they once again lacked any fluency in the final third. Chuba Akpom could have made the scoreline even more convincing for Hull, but fired just wide from distance in injury time, as Blackburn slipped to 19th in the table. "In the first half there wasn't much in it. The disappointing thing for me is we had the ball twice and Hull have scored two goals. "We secured possession and made wrong decisions, and they're a good side. The front two are a handful and they've still got a lot of Premier League players in their side. "Today I thought once the second goal went in, we looked far short. You can't play the way we did last week and then turn in that performance. "It will drive you mad. We have to find consistency quickly, really quickly." "We've missed two or three chances late on which could have improved our goal difference but we thoroughly deserved the win in my opinion. "I thought we were playing within ourselves in the first half and I wanted us to go and express ourselves and take the shackles off. "We knew we had more in the tank and I thought in the second half we gave a very good performance where we could have scored three or four. "That's as good as we've played for a long time." Match ends, Blackburn Rovers 0, Hull City 2. Second Half ends, Blackburn Rovers 0, Hull City 2. Attempt missed. Chuba Akpom (Hull City) right footed shot from outside the box misses to the left. Attempt missed. Craig Conway (Blackburn Rovers) right footed shot from the left side of the box misses to the left. Substitution, Hull City. David Meyler replaces Mohamed Diamé. Attempt saved. Corry Evans (Blackburn Rovers) right footed shot from outside the box is saved in the bottom left corner. Elliott Ward (Blackburn Rovers) wins a free kick in the attacking half. Jordi Gómez (Blackburn Rovers) wins a free kick in the attacking half. Ahmed Elmohamady (Hull City) wins a free kick on the right wing. Attempt saved. Ben Marshall (Blackburn Rovers) right footed shot from the right side of the box is saved in the centre of the goal. Assisted by Jordi Gómez. Corner, Blackburn Rovers. Conceded by Sam Clucas. Attempt saved. Chuba Akpom (Hull City) left footed shot from the centre of the box is saved in the centre of the goal. Assisted by Andrew Robertson. Corner, Blackburn Rovers. Conceded by Andrew Robertson. Attempt saved. Darragh Lenihan (Blackburn Rovers) right footed shot from outside the box is saved in the bottom left corner. Assisted by Craig Conway. Substitution, Blackburn Rovers. Elliott Bennett replaces Simeon Jackson. Attempt blocked. Robert Snodgrass (Hull City) left footed shot from long range on the right is blocked. Assisted by Moses Odubajo. Corner, Hull City. Conceded by Shane Duffy. Tom Huddlestone (Hull City) wins a free kick on the left wing. Attempt blocked. Abel Hernández (Hull City) left footed shot from outside the box is blocked. Assisted by Tom Huddlestone. Moses Odubajo (Hull City) wins a free kick in the defensive half. Attempt blocked. Ben Marshall (Blackburn Rovers) left footed shot from outside the box is blocked. Assisted by Craig Conway. Goal! Blackburn Rovers 0, Hull City 2. Mohamed Diamé (Hull City) right footed shot from the centre of the box to the centre of the goal. Assisted by Abel Hernández. Corner, Blackburn Rovers. Conceded by Curtis Davies. Attempt blocked. Elliott Ward (Blackburn Rovers) left footed shot from a difficult angle on the left is blocked. Corner, Blackburn Rovers. Conceded by Tom Huddlestone. Corner, Blackburn Rovers. Conceded by Michael Dawson. Attempt blocked. Jordi Gómez (Blackburn Rovers) header from the centre of the box is blocked. Assisted by Craig Conway.